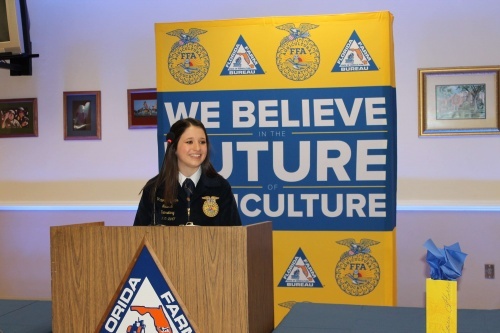 On Nov. 15, a reception was held at Florida Farm Bureau headquarters in Gainesville to honor Florida FFA’s Victoria Harris’s election as National FFA Secretary. Harris is the 23rd national officer from the state of Florida and only the third female national officer ever from our state. Harris had to endure an arduous selection process. She was selected to represent the state of Florida after submitting an essay and completing an interview. Then she practiced with many mock interviews before the process culminated in October at the National FFA Convention. The final round is different. Harris said it was just her and the nominating committee, sitting in a circle. No rubrics or score sheets. They ask three questions and she had no problems with the first two. That piece of mind obviously worked for Harris as she was notified two days later of her selection as National FFA Secretary. For the next 11 months, she will be stationed at the National FFA Center in Indianapolis and travel to roughly 35 different states. She will spend the majority of her time at state FFA conventions, camps and conferences. The remainder of her time will be spent meeting with industry representatives, planning conferences, speaking with legislators and learning more about U.S. agriculture. Read more about Victoria Harris in the 2017 Jan/Feb issue of FloridAgriculture.